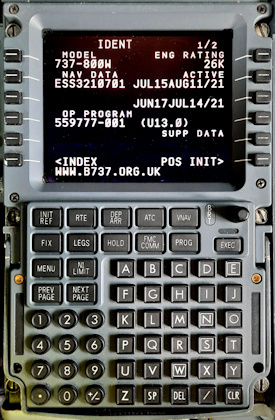 First introduced on the series 200 in Feb 1979 as the Performance Data Computer System (PDCS), the Flight Management Computer (FMC) was a huge technological step forward. Smiths Industries (formerly Lear Seigler) has supplied all FMCs installed on the 737. The PDCS was developed jointly by Boeing and Lear Seigler in the late 1970's. It enabled EPR and ASI bugs to be set by the computer and advise on the optimum flight level, all for best fuel economy. It was trialed on two in-service aircraft, a Continental 727-200 and a Lufthansa 737-200 for nine months in 1978 with regular line crews and a flight data observer. The 737-200 showed average fuel savings of 2.95% with a 2 minute increase in trip time over an average 71 minute flight. The 727 gave a 3.94% fuel saving because of its longer sector lengths. The PDCS quickly became standard fit and many were also retrofitted. By 1982 the autothrottle had been devised and thrust levers could be automatically driven to the values specified by the PDCS. The true FMC was introduced with the 737-300 in 1984 this kept the performance database and functions but also added a navigation database which interacts with the autopilot & flight director, autothrottle and IRSs. The integrated system is known as the Flight Management System (FMS) of which the FMC is just one component. Most aircraft have just one FMC, but there is an option to have two this is usually only taken by operators into MNPS airspace eg Oceanic areas. The FMS can be defined as being capable of four dimensional area navigation (latitude, longitude, altitude & time) while optimising performance to achieve the most economical flight possible. The photograph above is of the Control Display Unit (CDU), which is the pilot interface to the FMC. There are normally 2 CDUs but only one FMC. Think of it as having two keyboards connected to the one PC. The CDU in the photograph has a DIR INTC key at the beginning of the second row but some have a MENU key. This key gives access to the subsystems such as FMC, ACARS, DFDMU, etc. In its most basic form, the FMC has a 96k word navigation database, where one word is two bytes (ie a 16 bit processor). This was increased to 192k words in 1988, 288k in 1990, 1 million in 1992 and is now at 4 Mega words for the 737-NG with Update 10.7. The navigation database is used to store route information which the autopilot will fly when in LNAV mode. When given data such as ZFW & MACTOW, it takes inputs from the fuel summation unit to give a gross weight and best speeds for climb, cruise, descent, holding, approach, driftdown etc. These speeds can all be flown directly by the autopilot & autothrottle in VNAV mode. It will also compute the aircrafts position based upon inputs from the IRSs, GPS and radio position updating. The latest FMC – Model 2907C1, has a Motorola 68040 processor running at 60MHz (30Mhz bus clock speed), with 4Mb static RAM and 32Mb for program & database. An FMC has three databases: Software options (OP PROGRAM), Model/Engine data base (MEDB) and Navigation data base (NDB), all of which are stored on an EEPROM memory card. These databases can all be updated via the data loader. The Software options database includes the operational program and its update, plus any company specific differences. For a full list of all FMC software updates and their features, please refer to the book. The MEDB holds all the performance data for V speeds, min & max speeds in climb, cruise & descent, fuel consumptions, altitude capability etc. The NDB is comprised of Permanent, Supplemental (SUPP) and Temporary (REF). The Permanent database cannot be modified by crew. There are four types of data: Waypoint, Navaid, Airport and Runway. Runway data is only held in the permanent database. There is capacity in the SUPP and REF databases for up to 40 waypoints, 40 navaids and 6 airports. SUPP data can only be entered on the ground. It is then stored indefinitely but crew may delete individual data or the whole database. Any existing SUPP data should be checked for accuracy before flight using the SUMMARY option (U6+ only) or DELeted and re-entered, cross-checking any Lat & Longs between both crew members. All Temporary (REF) data is automatically deleted after flight completion. Eg. To create a new en-route VOR/DME, the Class code would be VDHW. The contents page. Pages required for the departure are listed on the left hand side. This INIT/REF INDEX page (shown right) is from an U6.2 aircraft equipped with ACARS and IRS navigation. Selecting MSG RECALL allows the recall of deleted CDU scratchpad messages whose set logic is still valid. ALTN DEST allows the entry of selected alternate airports. The NG (U7+) has some extra options available. The OFFSET function is used in-flight to fly parallel to a portion of the route. This may be used to avoid the turbulent wake of the aircraft ahead or to increase separation with opposite direction traffic. 5R will offer MAINT when on the ground, see below for some of these pages. IDENT: Check aircraft model and engine rating is what you are flying, especially if your airline operates a mixed fleet. Note that if a model is appended “.2” it has the SFP package and two position tailskid. Also check the database effectivity and expiry dates. Software update number is given in brackets, here U10.5A. U10 was specifically designed for the 737-NG but can be used on classics. POS INIT is used to enter the aircraft position into the IRS's for alignment. The Lat & Longs of REF AIRPORTS & GATES are held in the database and do not need typing in but should be cross-checked against published data. Routes are usually entered by inputting the CO ROUTE. Eg AMSLPLRPL = Amsterdam to Liverpool Repetitive Flight Plan. If the company route is not recognised the route can be entered manually by filling in the VIA & TO columns. In-flight the OFFSET option will be available on U7 onwards. See below to use this to access the hidden NEAREST AIRPORTS and ALTERNATE DESTS pages. After the route is entered, press the DEP ARR button on the CDU to access the departures and arrivals for the ends of the route. This is a typical arrivals page and allows selection of the required SID, Transition and approach. These are denoted by <ACT> when they have been selected. The PERF INIT page is completed before fight and gives the FMC the data to calculate leg times & fuels and the optimum & max altitudes. Cost Index is the ratio of the time-related operating costs of the aircraft vs. the cost of fuel. If CI is 0 the FMC gives maximum range airspeed and minimum trip fuel. If CI is max the FMC gives Vmo/Mmo for climb & cruise; descent is restricted to 330kts to give an overspeed margin. The range of CI is 0-200 (Classics) and 0-500 (NGs). CRZ WIND is actually used for both climb wind and cruise wind. If you enter the forecast top-of-climb wind before departure the FMC will recalculate your climb speed accordingly. When in the cruise if you enter the average cruise wind, the time and fuel calculations will be updated. If you do not enter anything here the FMC will assume still air. Standard take-off page for PF. Speeds & assumed temperature must be entered manually from performance tables. TO SHIFT should be entered if departing from an intersection as this is used to update the FMC position when TOGA is pressed at the start of the take-off roll. Notice that the reduced takeoff N1's (90.5/89.6) are different for each engine. This is because when the photo was taken only one pack (the right) was running. Used for entry of de-rates, where allowed. This is the N1 Limit page pre-U10. Provides thrust limit and reduced climb thrust selection. This is usually automatic but manual selections can be made here. The most common use is either to select a reduced climb thrust (1 or 2) after a full power take-off to reduce engine wear or to delete the reduced climb thrust to get a high rate of climb. 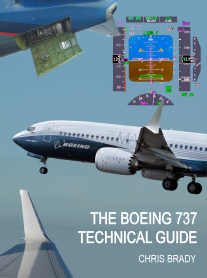 One of the most useful pages in the Boeing FMC and has just been updated to six pages in update 10.6. The fix can be anything in the database ie airfield, beacon or waypoint. An abeam point can be constructed (as illustrated) or a radial or range circle can be displayed on the EHSI. Surprisingly, there is no equivalent page on the Airbus. Standard ECON CLB page. 302 (Kts IAS) is highlighted indicating that this is the target speed, this will automatically change over to mach (0.597 in this case) during the climb. Other climb modes are available with keys 5 & 6, L & R.
CLB-1 indicates that the autothrottle is commanding a reduced thrust climb power (reduces N1 by approx 3% = 10% thrust reduction). CLB-2 is a reduction of a further 10% ie 20% total. The reduced climb thrust setting gradually increases to full climb power by 15,000ft. Selecting MAX RATE from a climb page will show this page with the target speed not highlighted and the ERASE option available until the EXEC button is pressed. If EXEC is pressed you can return to ECON by line selecting it. Selecting MAX ANGLE from a climb page will show this page with the target speed not highlighted and the ERASE option available until the EXEC button is pressed. If EXEC is pressed you can return to ECON by line selecting it. Selecting ENG OUT on a climb page gives the following choice of LT or RT engines. When the LT or RT engine has been selected this page shows your MAX ALT (climb or driftdown alt) TGT SPD and max cont N1. This is a useful page to check if flying over ground above 15,000ft. Remember the altitude penalties for anti-ice. The EXEC light will now be illuminated, if you press it you will lose all VNAV info. Select ERASE to return to the two engine CLB/CRZ pages. Standard PF in-flight cruise page. The target speed (highlighted) is the ECON speed which is derived from the cost index and winds. The fuel at EGLL figure is blank because either it is being recalculated or there is a route discontinuity. Selecting ENG OUT on the cruise page will give this page which asks you to select which engine is inop. After selecting the appropriate engine, the FMC will calculate your driftdown target speed and stabilisation altitude. It is worthwhile making this check before crossing over areas of high terrain. Do not press EXEC at any stage otherwise you will lose VNAV information, these actions can be undone by selecting ERASE. Selecting LRC gives Long Range Cruise speed. This is calculated as 99% of the maximum range speed for a given weight & altitude in still air conditions. It is used in preference to MRC because it is a more stable speed and hence gives less autothrottle movement. LRC takes no account of winds so it may give a higher fuel burn than ECON. It also takes no account of operating costs; hence it has little practical value. FPA is the actual flight path angle of the aircraft, it is zero in this example because the aircraft is in level flight. It is typically 3 to 4 degrees in a descent. V/B is the required vertical bearing to reach the WPT/ALT ie TIGER/16000. This would be an altitude restriction in the LEGS page that you could enter (or delete) manually or with the ALT INTV button on the MCP if fitted. V/S is the required vertical speed to make good the V/B. As you approach your ToD the FPA will remain at zero (because the aircraft is in level flight), but the V/B and V/S will both increase until the V/B is at about 3 to 4 degrees, or whatever the FMC has calculated is the optimum value. If VNAV is engaged the aircraft will descend with a FPA equal to the V/B. The actual V/S will however be slightly different to the computed V/S because V/S changes during the descent. FMC position can be forced to any of the other positions at this page. You can either select a waypoint from the legs page or use PPOS (Present POSition) on which to base the hold. The database will give the turn direction & inbound course. Leg time will be that appropriate to your altitude . Target speed will default to the best speed which will be that for max endurance. Hold avail is calculated from the present fuel, fuel flow and reserves figure entered into the PERF INIT page. Very rarely used. Sets min & max speed limits for climb, cruise & descent. Very useful howgozit page, but don't trust the fuel summation unit! it always overreads by approx 1-200kgs. For an accurate arrival fuel subtract 2-300kgs to allow for this and the drag of flying slower than the optimum speed whilst on the approach. Very rarely used but can be used to try to reach a waypoint at a specific time. PROGRESS 3/3: Standard landing page for PF. Especially useful for giving crosswind component and SAT in icing conditions. Confusingly this page has now been moved to 2/4 on U10.7, so instead of selecting Progress-Prev Page you now have to select Progress-Next Page. APPROACH REF: Standard landing page for PNF. Vref is calculated from the current gross weight, pedants may wish to overwrite the GROSS WT with the predicted GW for landing. Vref is "hardened" by line-selecting it over itself which will cause it to be displayed on the speed tape. The following pages are only available on ANS equipped aircraft. Similar to ACT RTE LEGS. Similar to ACT RTE DATA. Caution do not access these pages without engineering supervision. These are various pages hidden away in most FMC's that are not always immediately available to the pilots, I suspect because there would be a surcharge to their airlines to use them. There are some ingenious ways of getting to these pages by careful use of simultaneous CDU entries. This is not a hidden page, but it is the way into them. You can bring up this OFFSET page either from RTE or INIT/REF INDEX. 1. Have this page displayed on both CDU's. 2. Enter any offset but do not execute. 3. Simultaneously press ERASE on both CDU's. All the diversion data is now shown based on you flying direct to this alternate from present position (VIA DIRECT). Selecting MISSED APP will show the same data but calculated from the missed approach point. This extremely useful page takes a couple of minutes to calculate but will list the nearest airports in the database in order of DTG. Once again, line selection of 1R to 5R will give more useful diversion information as shown below. All the diversion data is now shown based on you flying direct to this airport from present position (VIA DIRECT). Selecting MISSED APP will show the same data but calculated from the missed approach point. Selecting INDEX to return to the normal pages.